Subsequent to the Honor 8 and Honor 8 Premium, which came with some extra internal memory, the Chinese manufacturer is completing this smartphone trinity with the Honor 8 Pro. The new Honor smartphone holds promise to, once again, be a hit in terms of price vs performance, but can this smartphone hold its ground in the increasingly competitive market of smartphones today? We've recently jumped this phone through the hoops to bring you our full review, so now you'll be able to get an even better picture on the pros and cons for the Honor 8 Pro. The Honor 8 Pro was officially launched on April 5, 2017 and was first released for sale in the UK, France, Germany, Italy, Spain and Switzerland on April 20, 2017. At the moment there is no word yet on when it will be arriving in the US, though when it's released, it's expected to retail at a price of around $585. In addition to the blue color version we tested in this review, there is also a gold and a black version. 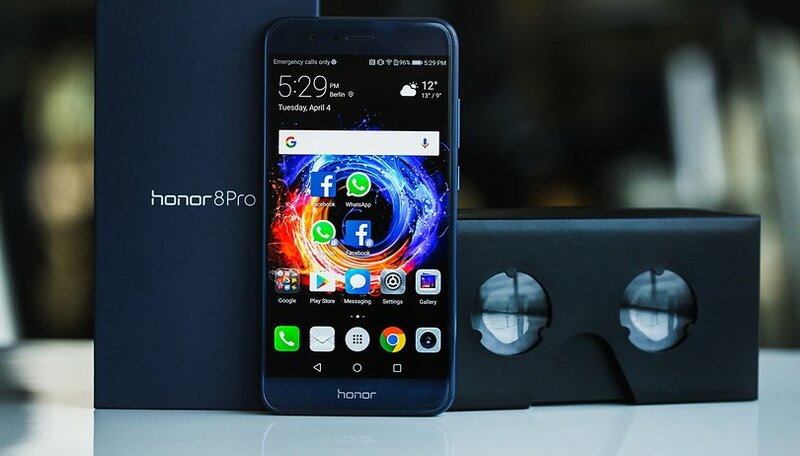 Looking at the specs of the Honor 8 Pro, the more technically savvy smartphone user will quickly realize that the Honor 8 Pro is a clever amalgamation of several of Huawei's 2016 flagships: the Huawei Mate 9, the Huawei P10 Plus and the Huawei P9. This is reflected internally but is barely noticeable in the external design of the smartphone. The Honor 8 Pro looks quite unlike its siblings, the Honor 8 and Honor 8 Premium, as it's wrapped in a full metal unibody case that is reminiscent of the iPhone 6 Plus or the iPhone 6s Plus. The only obvious indications that this smartphone is not a product from the Cupertino-based company are the dual camera and the fingerprint sensor on the back of the device. Since the fingerprint sensor on the Honor 8 Pro is on the back of the smartphone, thus differentiating Honor from its mother company Huawei, it can accommodate a 5.7-inch WQHD display on the front of the smartphone. The top and bottom bezel of the smartphone are therefore smaller than on the iPhone 6 Plus, but compared to a Samsung Galaxy S8 and LG G6, they are still very wide. As for how it feels, the Honor 8 Pro cashes in at a very high level. It's very robust thanks to the unibody metal housing and there are no irregular seams or gaps that interfere with the sleek exterior. The buttons, like the case itself, are made of metal, and the on/off button has a patterned surface so that one can easily identify it by touch without having to look at it. It's worth noting that Honor did not compromise on this great smartphone in any way: all four sides are designed to provide improved grip. In terms of the display, Honor is taking its first step towards VR with the large 5.7-inch LTPS IPS panel with a maximum resolution of 1,440 x 2,560 pixels. Thus, you get a pixel density of almost 515 ppi. Thanks to the high resolution, the Honor 8 Pro is ready for its first VR experiences. You can immediately enter virtual worlds in your own home through the Jaunt VR app and in addition, in the Honor 8 Pro packaging, you get a cardboard VR headset. Unfortunately, those of you with Daydream View will be disappointed with the Honor 8 Pro. Even though the display has a high resolution and the performance capacity of the Kirin 960 SoC is more than sufficient to meet Google's VR standard, it seems that Honor and its parent company will not be Daydream-compatible just yet. However, the LTPS IPS panel works very well in everyday use of the smartphone. The AMOLED display isn't missed much in the Honor 8 Pro as the screen is bright and colorful. The viewing angles are great, too. The only things that interfere with it are direct sunlight and reflections, but even devices like the LG G6 or the Samsung Galaxy S8 haven't been able to find a solution to this yet. Like the Huawei P10 and the P10 Plus, the Honor 8 Pro comes with Android 7.0 Nougat and EMUI 5.1. Since EMUI 5.0, Android users have been enjoying an app drawer on Huawei and Honor smartphones. This can be turned on or off. In addition to some small Nougat feature additions for Android fans, Huawei has also done a lot under the hood. This includes non-aging memory called Ultra Memory for improved RAM management, and Ultra Response for improved touch input. There are also some convenient features that simplify single-handed operation. A swipe to the left or the right over the navigation bar shrinks the screen slightly so that you can reach parts of the screen more easily with your thumb. The fingerprint sensor can also be used for nifty functions. In selfie camera mode, the sensor can be used to take a picture. It can also open the notifications bar (swipe from top to bottom) and if you swipe from left to right in the gallery, you can scroll through your pictures. But why didn't Honor and Huawei integrate more functions for this button? What about vertical scrolling through long websites or documents? Since the Mobile World Congress 2017, it's well known that the Google Assistant is no longer a Pixel-exclusive feature. LG, Lenovo, Samsung, Huawei and thus also Honor will get the assistant in the future. When we started testing the phone, the availability of the assistant was announced after just a few hours. This could be because we set the system language to English for our review though so if you have an Honor or Huawei smartphone and you want to have the Google Assistant, try setting the system language to English and then regularly check your Google Now Cards. A further innovation that the Honor 8 Pro shares with the Huawei P10 and P10 Plus is its cooperation with GoPro. With the Honor 8 Pro, the Quik video editor app is supplied by the action cam specialist. Unfortunately, there is a small bug in the software: each time you start the app, it creates a new shortcut on the Home screen. Such small bugs are annoying, but they still occur so hopefully this one will be fixed with the next update. Otherwise, EMUI 5.1 and Android 7.0 Nougat on the Honor 8 Pro proved to be non-problematic. Fluidity was not a problem with the software or the hardware. Inside the Honor 8 Pro is the SoC from Huawei's own chipmaker, HiSilicon. The Kirin 960 with the Mali G71 GPU is not unknown on the market of the mobile processors. Huawei presented the Kirin 960 with the launch of the Mate 9 last year and is now using the SoC in the Porsche Design Mate 9 and the P10 and P10 Plus duo. In the benchmark tests, the Honor 8 Pro falls behind in terms of graphics-intensive apps, but one mustn't forget that the Honor 8 Pro has to power a WQHD in comparison to the Mate 9 which "only" has Full HD. In addition, the Mate 9 has already received some performance updates, which the Honor 8 Pro is surely yet to receive in upcoming updates. The benchmark comparison shows that the Honor 8 Pro matches the performance of the Huawei devices, which is no big surprise since its hardware is nearly identical. The Honor 8 Pro surpasses the performance of the new LG G6 with its Snapdragon 821 processor - at least this is what the Geekbench 4 and PCMark scores indicate. The Samsung Galaxy S8 is within reach of the Honor 8 Pro, though its main advantage is its use of the Mali G71 MP20 GPU. This provides the Galaxy S8 with 20 shader units, making it an ideal device for gaming. Although the Honor 8 Pro also has the Vulcan API-capable Mali G71 GPU, the MP8 variant in the Chinese manufactured phablet has only eight shader units compared to the Exynos 8895 of the Galaxy S8. Benchmarking tests push the phone to its performance limit, which is not representative of daily use. In normal everyday life, the Honor 8 Pro proves to be a reliable companion that runs apps quickly and tirelessly. Lag and waiting times when loading apps? No real issue for the Honor 8 Pro. It's on the same level as Huawei's own devices. Even for future games, the Honor 8 Pro is ready because Vulkan API is supported. There isn't much to complain about when it comes to sound quality of the Honor 8 Pro including during phone calls. I tested the phone in the noisy environment of a train station and there were no problems and the person on the other end could understand me clearly too. But since a smartphone is no longer used just for phone calls and the Honor 8 Pro is also predestined for multimedia use, one must, of course, carefully consider the audio quality from this point of view too. The Honor 8 Pro has many components of the Huawei Mate 9, but it doesn't have the ability to use the phone speaker as a second loudspeaker for games and videos. The mono loudspeaker sits on the right of the USB type-C jack on the Honor 8 Pro and sounds alright. At maximum volume, some distinct distortions can be heard, but this problem isn't specific to the Honor 8 Pro, it's an overarching smartphone manufacturer problem across many devices. If you have a good set of headphones, you can continue to use them with the Honor 8 Pro because there is still a 3.5 mm jack. Unfortunately, I personally miss the option for Wi-Fi calling on the Honor 8 Pro. Some of the larger network operators offer the possibility of making telephone calls over Wi-Fi if you ever find yourself in an area with poor network coverage. I've been able to appreciate this function in my apartment for a few months now, since the building shields the mobile network so strongly most of the time, the smartphone can't be used to make calls or send texts. Unfortunately, the Honor 8 Pro does not currently support Wi-Fi calling, so this handy feature can't be used. It's quite obvious that Honor did not build the Honor 8 Pro from scratch. To further highlight this, Honor has access to larger Huawei components and can therefore very cost-effectively build a smartphone for its own target market. With the camera, Honor also follows the same procedure and, like its sibling the Honor 8, it takes its hardware from Huawei. The dual camera of the Honor 8 Pro has two Sony IMX286 image sensors like on the Huawei P9's dual camera. One of the two image sensors is responsible for high-contrast black-and-white information, while the other is responsible for color. Through software manipulation, information is combined from both images to produce a final result. Another advantage of the dual camera setup is in the app because there is a small aperture icon. With the help of "large aperture" mode, one can actually change the hardware-dependent f / 2.2 aperture. In this mode, you are given the possibility to adjust the aperture of the picture composition. If you want to place an object in the foreground, simply select a correspondingly large aperture of up to 0.95. The focal point and the aperture can be adjusted later on in such images. The Bokeh effect is nice to look at, but since this is a software solution, it has its limits. In situations as shown below, the software is at its limit. Normally, the leaves, which can be seen around the triangular sign, should be out of focus, since these do not lie on the same focal plane as the sign. But the software has unfortunately failed. Luckily, the image can be adjusted to fit into the aperture, so that this kind of weakness from the software is minimized. If you know the weakness of this software, then you can bear it in mind when taking the picture. A more in-depth camera comparison will be done separately at a later date. For this initial test, the pictures taken on the Honor 8 Pro are quite nice, as long as the lighting conditions are half-way decent. The less light is available and the higher the ISO values, the more noise will unfortunately be added in the picture. One of the reasons for this is certainly the small IMX286 image sensors. These are 1:2.9 in comparison and pixel sizes of about 1.25, which is smaller than top smartphones like the Google Pixel, Samsung galaxy S7 or S8. But here also, it's important to reiterate: the retail price of these competitors are significantly more expensive. Here is our gallery of Honor 8 Pro pictures on Google Photos in full resolution. Photos are one thing, but moving pictures in video format are also becoming increasingly popular. With the Honor 8 Pro, you can finally record videos in 4K unlike the former two models in this trio. Unfortunately though, there is a catch: in order to reduce the file sizes in 4K recordings, the Honor 8 Pro records these videos with the modern h.265 codec. Compared to the current h.264, the successor offers better compression with less quality loss. Unfortunately, this also means that in the post-processing phase of videos in 4K on PC or Mac, the file must first be converted into the older format as most software can't read the latest codec. Only then can most video editing programs like Adobe Premiere or Final Cut "understand" 4K videos filmed on the Honor 8 Pro. You can also edit the videos directly on the smartphone and upload them to YouTube and other video platforms, but in these cases, the smartphone once again converts the video and provides it in a codec and resolution that is understandable by the platform. For YouTube, for example, only UHD videos can in 4K and QHD videos in 2K are available. As with the software blending problem, the complaints only come from the more tech-y users. In normal everyday life, where you share pictures and videos only via Twitter, Facebook and so on, these weaknesses barely matter. Surprisingly, the Honor 8 Pro's very slim housing has managed to accommodate a battery with a nominal power of 4,000 mAh. This corresponds exactly to the capacity of the battery from the Mate 9. The PCMark battery test results in a running time of 8 hours and 16 minutes from 100 percent to 20 percent. The Huawei Mate 9 did 11 hours and 46 minutes in the same benchmark test thanks to the low-resolution display. It's a small price to pay if you want a higher-resolution display. Additionally, the Huawei Mate 9 has already received some firmware updates, so overall the software is a better match for the Honor 8 Pro. The Honor 8 Pro has considerable battery power to support normal everyday use. Honor itself has indicated that the phablet's battery was able to withstand two days of normal use. Under intensive use, the 4,000 mAh battery lasted nearly 1.5 days. Of course, what Honor considers to be "normal" or "intensive" use wasn't clear. For my own everyday use, which I am the first to admit comes in at intensive, the Honor 8 Pro actually did survive for 1.5 days. If the battery is in the critical range, the Honor 8 Pro can be fully recharged within 1 hour 45 minutes with the help of Huawei's fast charging technology, Quick Charge. This would have been better optimized if Huawei's Supercharge battery had been included, but since it wasn't, we'll never know. With the new 8 Pro, Honor has intelligently seized the hardware from Huawei and leaned heavily on Apple's design. The result isn't bad at all. The design, which is based on the iPhone, meets the demand of a large target market, and with the hardware, its slogan "Born for Speed" is underlined with the fastest hardware the parent company currently has. As a result, the overall package being offered by Honor is extremely attractive. The last and most important sales argument is the price. At around $590, the Honor 8 Pro is cheaper than the the other devices in its group like the Huawei Mate 9 and the P10 Plus. Therefore, once again, Honor has presented us with an attractive package in terms of price vs performance. Even the new flagship devices already released in 2017, such as the LG G6, HTC U Ultra or even the yet to be released Sony Xperia XZs and Xperia XZ Premium, can't quite match the performance of the Honor 8 Pro and still cost around $200 more. If you look beyond the direct competition, however, smartphones released in 2016 such as the OnePlus 3T, Samsung Galaxy S7 Edge and also the Moto Z from Lenovo are also likely contenders to match the Honor 8 Pro. In keeping with Honor's slogan #ForTheBrave, one final question remains: are you willing to be brave and select the Honor 8 Pro as your new smartphone or would you prefer to stay with a "safer choice" like a 2016 flagship device? Again ... no HAC .... hearing aid compatibility. Having more choices is always good, I agree. Brittney, I like the idea of 6gbs & a 4000mamp battery. I think Huawei has some very good ideas. After the 6p their phones are getting increasingly better. I just with an American carrier would offer the 8 Pro! I would not hesitate in picking one up! Really a cheap phone with high configuration, as well as dual-camera. I'm a big fan of Honor as it consistently offers great hardware for a more reasonable price than some other brands. I like the Honor and the Huawei brand. Good article. Good phone but a little pricy (for Honor brand), nearly same price than the P10, but with better bigger screen. But the screen resolution could be realy less (for me) because of the battery. 1080p would be enough for me. As is use the Mate 9 and i am very happy with it, there is no need to buy this one, but if I would not have the Mate 9, I guess, I would buy this one. In China, it is named Honor V9 rather than Honor 8 Pro, and it is priced at 2999 CNY (around $434). Haha, if I would not have Mate 9, I would buy the 8 Pro too. Can we reduce the screen resolution to 1080p in the settings? If we can, with a little bit discount I would buy this phone. Looks legit. You can still get the Honor 8 in the US, but I'd like to see more Honor devices released here too!